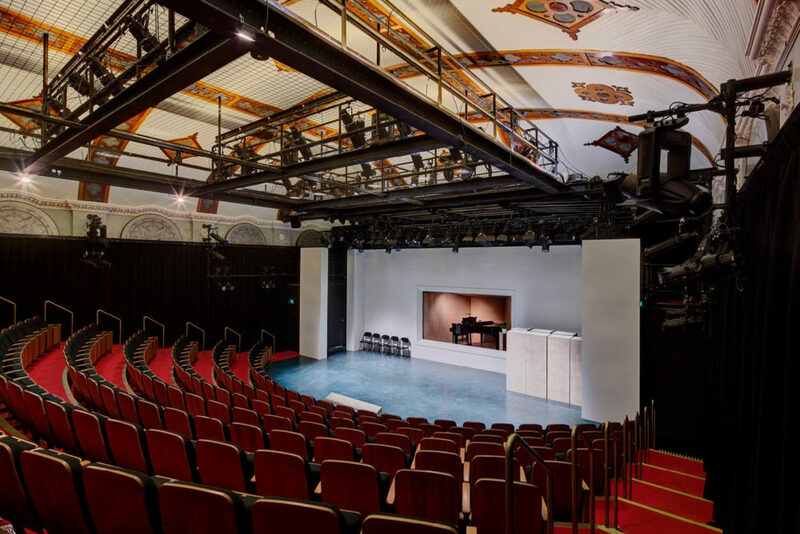 The Eternity Playhouse was once the church that inspired Mr Eternity (photo: Brett Boardman). Compelled over decades to chalk ‘Eternity’ on the city streets, Arthur Stace has gone down in history as a Sydney folk hero. 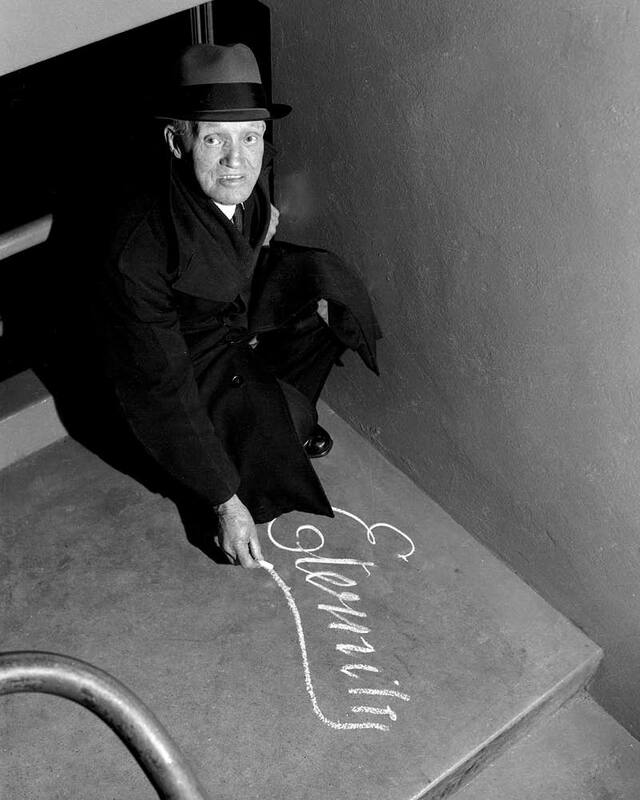 Almost every day before dawn for 37 years, Arthur Stace would write the word ‘Eternity’ on the streets of Sydney in chalk, rendering it in a beautiful copperplate script. He was for a long time anonymous; his identity a mystery until it was revealed by the Sunday Telegraph in 1956, when Stace was aged 72. A rare photograph of Arthur Stace, from 1963 (photo: Trevor Dallen/Fairfax Syndication). Or so the story goes. Artist and lifelong Sydney resident Robert Eadie remembers Stace from the 1940s and ’50s as a friend of his grandfather’s. “We all knew he was the man who wrote on the footpaths, but my understanding later was that ‘nobody’ knew that,” he says. “Well, we did.” Eadie was a schoolchild growing up in Pyrmont when Stace would call into his house around 8am on his way back from a morning’s signwriting. “And he’d have a cup of tea with the old fella in the lounge room,” he says. Eadie’s next door neighbour, a boy named Huey, would pinch chalk from his Catholic school for Stace to use. A former soldier and a reformed alcoholic, Stace had converted to Christianity when he heard the evangelist Reverend John Ridley preach at the Burton Street Tabernacle in Darlinghurst about how he wished he could ‘shout eternity through the streets of Sydney’. 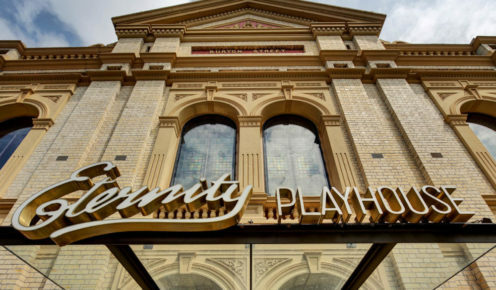 A tribute to Sydney’s history: Eternity Playhouse. 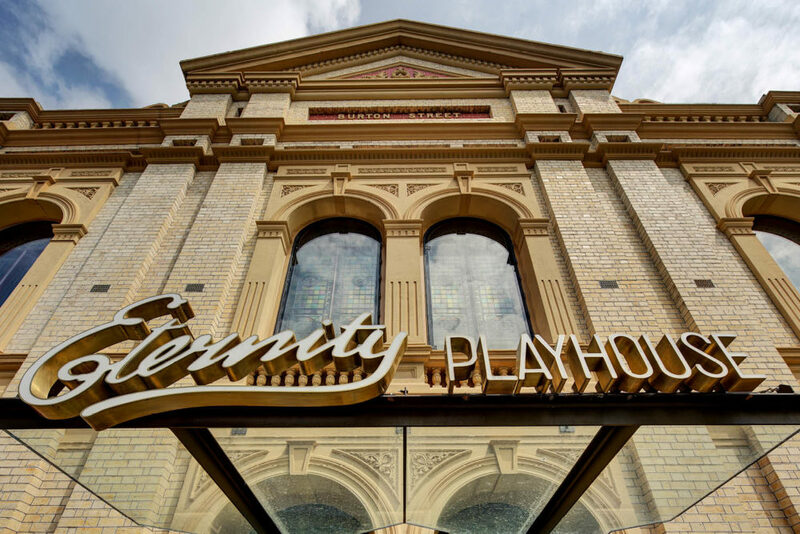 Today, the restored Baptist church is named Eternity Playhouse in honour of Stace, and is home to the Darlinghurst Theatre Company. “It was [here that] Arthur Stace heard the sermon that inspired him and his one-man mission,” says Glenn Terry, the company’s CEO and creative producer. The cursive letters are presented with pride on the building’s façade. Nonetheless, he became mythologised and his message an unofficial emblem of the city: it features joyously in the work of the late artist Martin Sharp, and was beamed around the world in lights from the Harbour Bridge as part of Sydney’s Millennium celebrations. When Stace died in 1967 he was on his way to becoming a Sydney folk hero, dubbed Mr Eternity or Eternity Man.